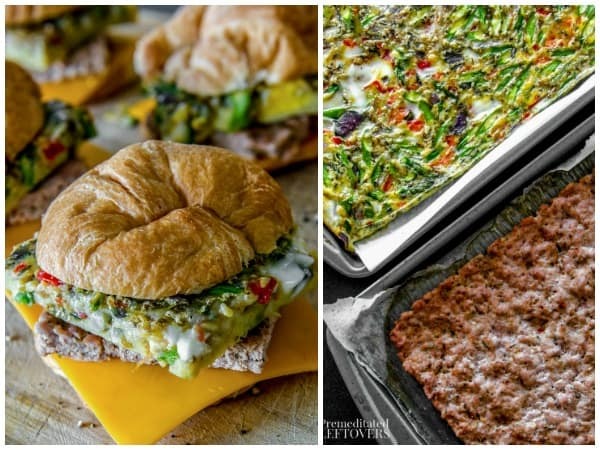 These make-ahead Cajun Egg Croissant Sandwiches from the cookbook Prep-Ahead Breakfasts and Lunches are a great addition to your Meal Prep Sunday routine! The recipe makes 12 breakfast sandwiches that you can just grab and go on busy mornings! When I talk to people about what meals are the most stressful, they often mention dinner. At first, I was confused because while I don't have a lot of time to make dinner, I have way more time to cook at dinner time then I do when I am preparing breakfast or lunch. And then I realized when talking with some friends that the reason they never mention breakfast as hard to make is that they had completely given up trying to make breakfast from scratch and were primarily serving packaged foods for breakfast. 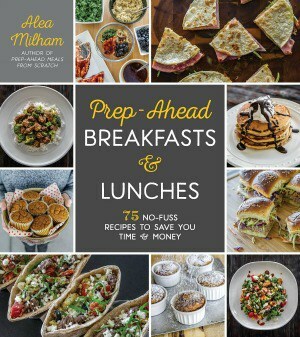 If you want to limit packaged foods, Prep-Ahead Breakfasts and Lunches includes a number of make-ahead breakfast recipes that can be made ahead of time using wholesome ingredients, then stored in the refrigerator or freezer and pulled out in the morning for an easy breakfast that can be served in minutes. There are even some easy breakfast on-the-go options like these Cajun Egg Croissant Sandwiches. Many of the recipes in Prep-Ahead Breakfasts and Lunches make a large number of servings, like the breakfast sandwiches which make 12 hearty servings, meaning that you can make just 2 or 3 breakfast recipes on the weekend and feed your family breakfast all week long. You can do this as part of a 1 – 2 hour meal prep session. You can also do this by committing to making breakfast from scratch on Saturday or Sunday and then making either a double batch on one of your families favorite breakfast recipes or, depending on your family size and preferences, make another breakfast recipe or two while the first one is cooking. 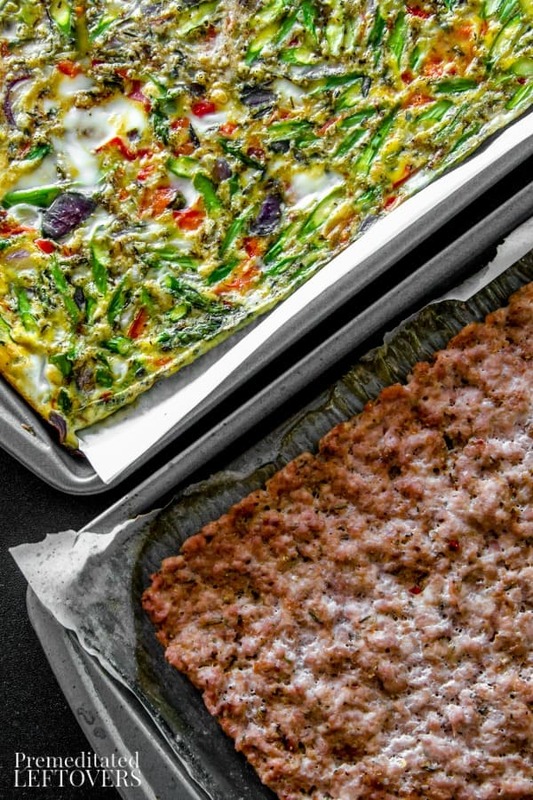 One of my family's favorite prep-ahead breakfasts is breakfast sandwiches which I create by first making sheet pan eggs and sheet pan sausage. I then slice up the eggs and sausage into squares using a pizza cutter and quickly assemble the sandwiches in an assembly line fashion. 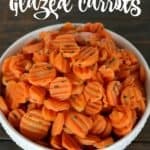 By combining batch cooking and easy meal prep techniques, you can reclaim breakfast and easily serve homemade meals even on the busiest of days! 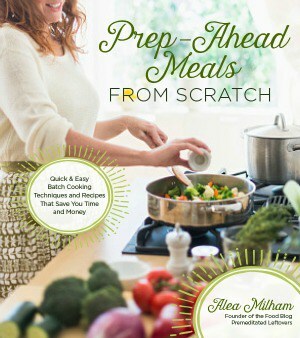 If you want to see more of the make-ahead recipes in my cookbook, take a peek inside the book here. This breakfast sandwich recipe is from Prep-Ahead Breakfasts and Lunches. Images by Ken Goodman. Used with permission. There are a couple of steps involved in creating these croissant breakfast sandwiches, but they really aren’t that hard to make. And boy are they worth the effort! 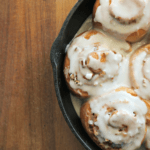 *If you follow a gluten-free diet, use this list of gluten-free substitutions for the recipes in Prep-Ahead Breakfasts and Lunches to adapt all of the recipes. to make the eggs, preheat oven to 350 degrees. Grease two 15 x 10 rimmed baking sheet, then line them with a piece of parchment paper. Add the eggs to a medium bowl. Beat the eggs until they are a pale yellow color. Add the onion, bell pepper, asparagus, and Cajun seasoning to the eggs. Mix well. Pour the egg mixture into one of the baking sheets. Bake the eggs for 30 minutes or until the eggs are cooked through and starting to separate from the edges of the pan. Let the eggs sit for a couple minutes. Use a knife or pizza cutter to cut the eggs into 12 squares. While the eggs are cooking, make the sausage by combining the pork, broth, and 2 tablespoons Cajun seasoning together in a medium bowl. Spread the pork mixture out evenly on the baking sheet so that it touches all of the sides. Bake for 20 minutes. Remove the sausage from the oven let it sit for a few minutes. Brush off the excess oil with a pastry brush or blot it with a paper towel. Then use a knife or pizza cutter to cut the sausage into 12 squares. To build the breakfast sandwiches, slice the croissants in half. Place one slice of cheddar, one square of sausage, and the one square of egg on the bottom of the croissant. Place the top of the croissant on top of the egg. Allow the breakfast sandwiches to cool before storing them. 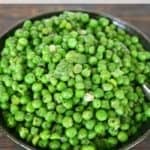 Place them in an airtight container and store in the refrigerator for up to 3 days. To freeze, wrap each breakfast sandwich individually and freeze for up to one month. To reheat a thawed breakfast sandwich, unwrap it and place it on a microwave-safe plate, and microwave on high for 30 – 45 seconds. To reheat a frozen breakfast sandwich, unwrap it and place in on a microwave-safe plate, and microwave it at 50% power for 3 minutes. 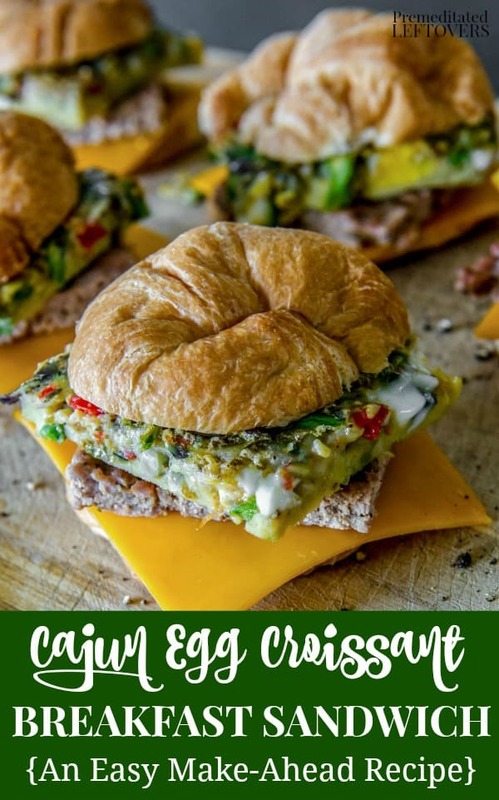 This prep-ahead breakfast sandwich can be stored in the refrigerator or frozen making it a great meal prep breakfast recipe to make ahead of time and then grab-and-go on busy mornings! To reheat a thawed breakfast sandwich, unwrap it and place it on a microwave-safe plate, and microwave on high for 30 - 45 seconds. 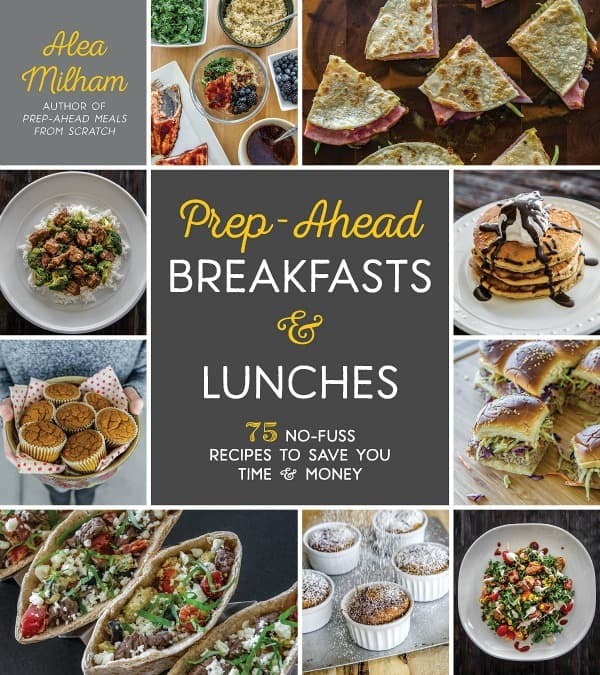 For more make-ahead breakfast recipes, check out my latest cookbook Prep-Ahead Breakfasts and Lunches!